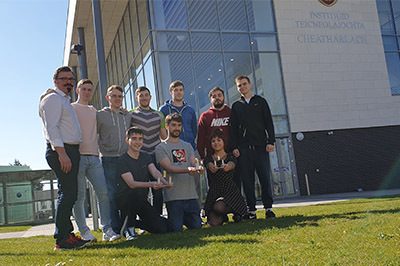 IT Carlow Computer Games Development students scored a hat trick winning first, second and third place at the recent GameCraft Cork 2019, which was held in memory of St John’s Central College Lecturer, Paul O'Brien. Over the eight-hour long event, seven Carlow teams-built LEGO adventures themed games. When 'the people's vote' concluded, IT Carlow students' games were selected as overall winners, second and third place. The prizes were presented by the late Paul O'Brien's family and friends who remembered his ingenuity in bringing GameCraft to St John’s Central College six years ago. Congratulating the award-winning students Nigel Whyte, Head of Computing Department at the Institute praised the students for their "remarkable successes, which celebrate art and algorithms in code" adding that the college is branching out with a new Interactive Digital Art and Design Course starting this September at IT Carlow, "We're looking forward to welcoming our new cohort of Interactive Digital Art and Design students later this year at IT Carlow." He went on to say, "The Crawford Art Gallery, Cork is currently honouring renowned Irish artist Mary Swanzy. Swanzy witnessed the birth of Modern Art and eventually expressed her love of mathematical forms and algorithms in her Cubist and Futurist paintings. Cubism, art and algorithms were celebrated today by our Game Development students." The award-winning games will be on display during Institute of Technology Carlow’s Industry Showcase 2019 which takes place on the 11th of April at the Carlow campus, where employers are welcome to attend and meet final year students exhibiting their portfolio projects. First place went to Jamie Murphy, Eric O’Toole, Jack Dalton and Aaron Curry. Oisin Moore, Ethan Fagan, Jonelle Lawler, Thomas Lloyd and Robin Meyler took second place and Paul O’Callaghan was awarded 3rd place.